This is brilliant. Great job Carhartt. A carefully crafted blog about women getting things done, carving, building, scaffolding, painting, etc – but the kicker is that they are all wearing Carhartt clothing. Well done. A very smart campaign. I love it when we can help someone out in a pinch. That’s why we have the emergency services line. (215) 743-2200. Kind of like the Bat phone for scaffolding. I’d like to think that our very own Bob Sarkisian is Batman (in a way). But really, the only time he’s like the caped crusader is when he’s climbing the side of a building in one of his swing stages or answering the Bat phone, like this case. 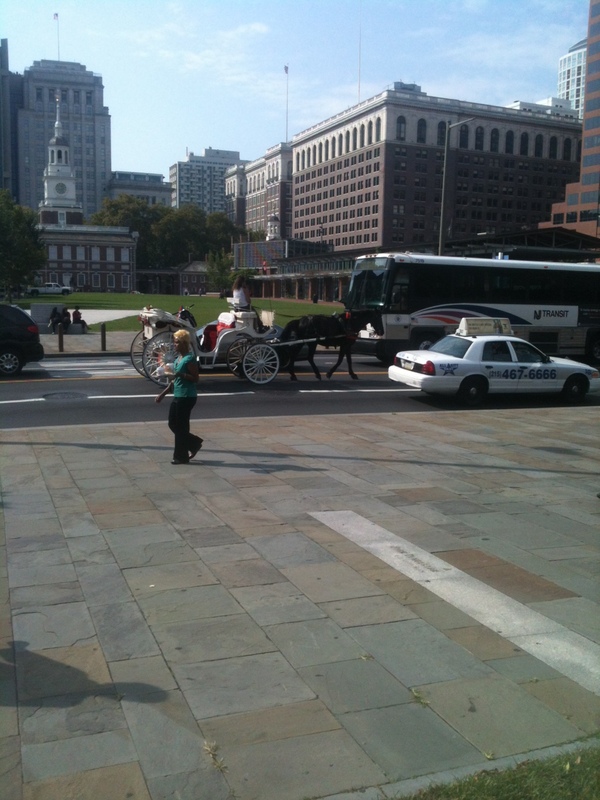 The guys over at 13th and Chestnut needed to get to the top elevation for some cornice repairs and reconstruction. And they needed to get up “air” fast. The job was put into overdrive. 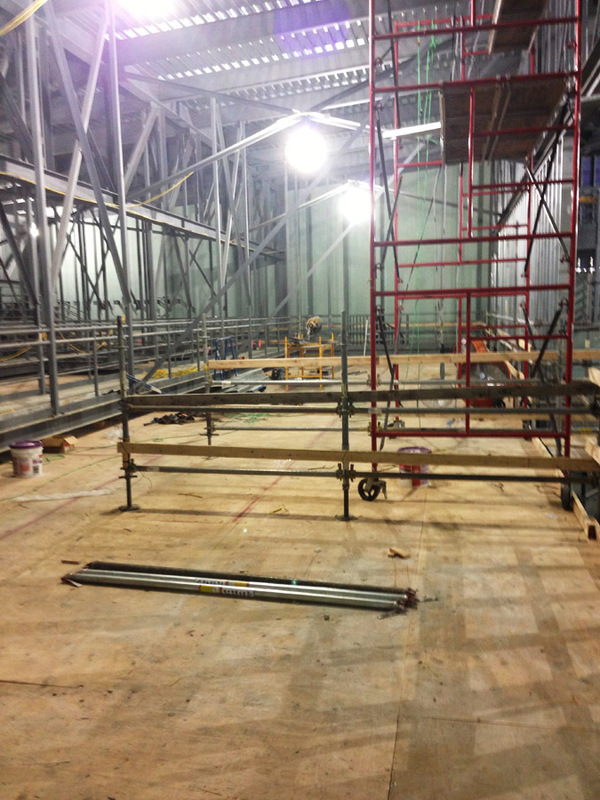 From the time Batman (Sarkisian) at Superior Scaffold took the call – all the way through design, engineered drawings, approval, and erection it took only 7 days. 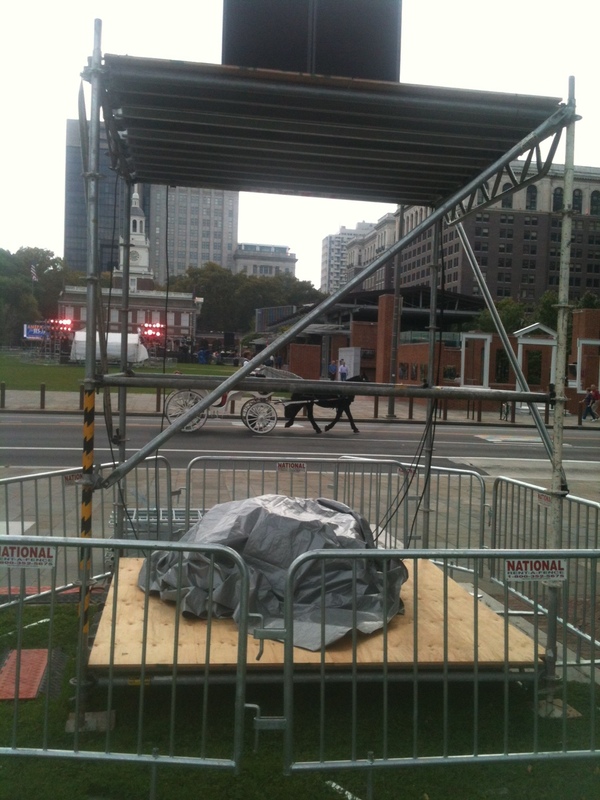 We even added containment netting too. Bam! Pow! Zap! Done! Holy Bat Erection. Yes, another satisfied customer. So when you need something in an emergency situation – don’t turn on the Bat signal (Sarkisian or McDonald will never see it – too busy analyzing what effect Bat guano has on steel cross braces) make the call to Superior Scaffold’s emergency service line (215) 743-2200. You won’t be disappointed. More pics to come, as the job continues. How do you change light bulbs on the ceiling above a giant spiral staircase that descends several floors? 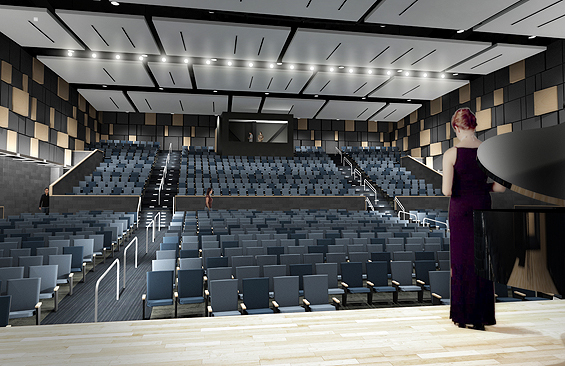 You can see the light fixtures just out of reach from the railing in the shot. Sure, you could dangle precariously from several extension ladders, or you could cautiously lean over the edge while your coworker holds onto your belt loop while you reach with all of your might to grasp the super hot bulb and pray that you didn’t piss them off in the past. But then, how would you get to the recessed ones directly in the center? Hmmmm??? 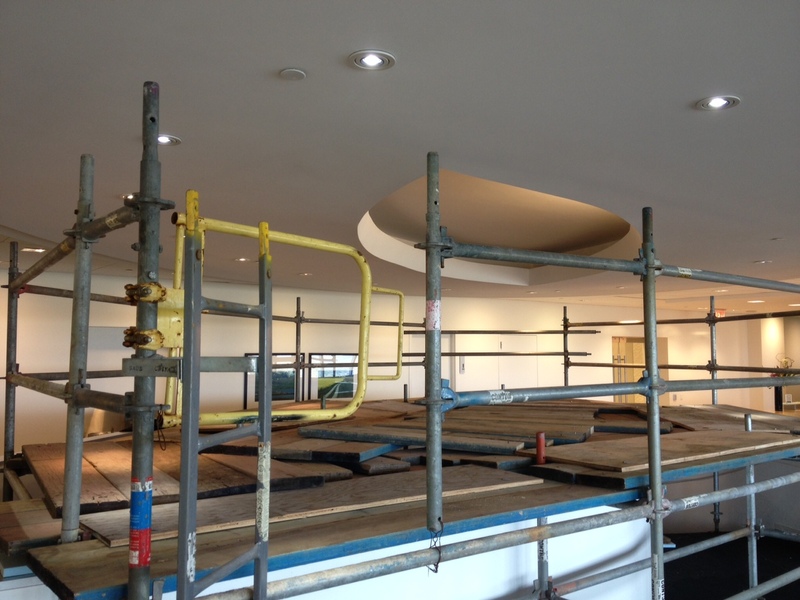 Or you could do it the Superior Scaffold way – using system scaffold. 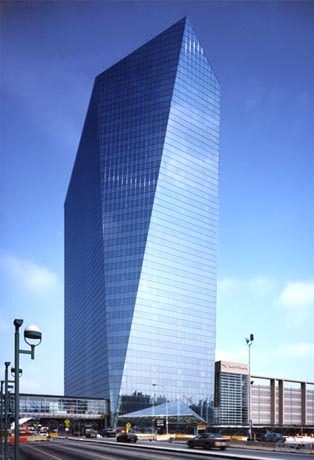 The Cira Centre is a 29 story glass high-rise in the Universal City area of Philadelphia. You can’t miss the glass structure against the skyline. They had a problem. Several of the light bulbs in the ceiling had burned out and they couldn’t reach them to change them out. They called Superior Scaffold to devise a creative way to breach the spiral staircase in between the 24th and 26th floors so crews could replace the old bulbs with longer lasting energy efficient ones. 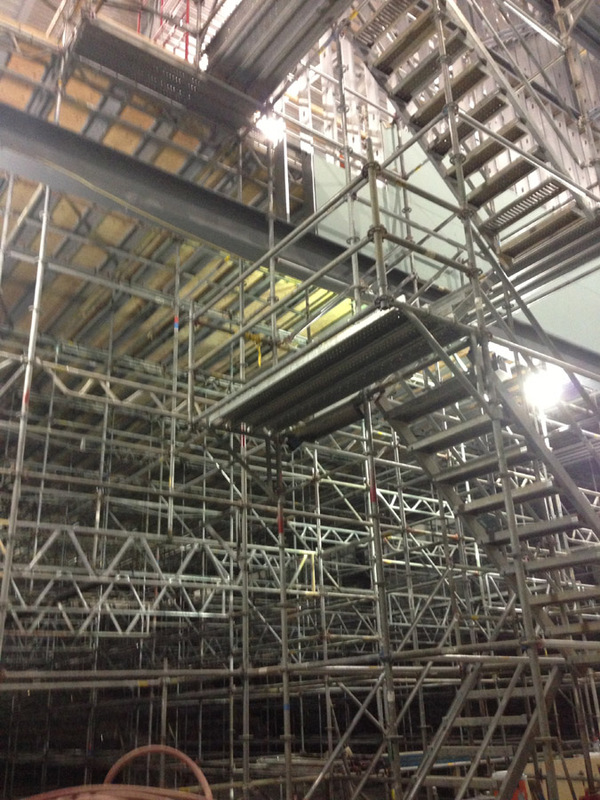 “The benefit of using system scaffolding in an area like this is that we can build the base around almost anything, even a spiral staircase. It’s very versatile and stable, especially when you need legs of different lengths or heights,” said estimator, Pat McAndrew. 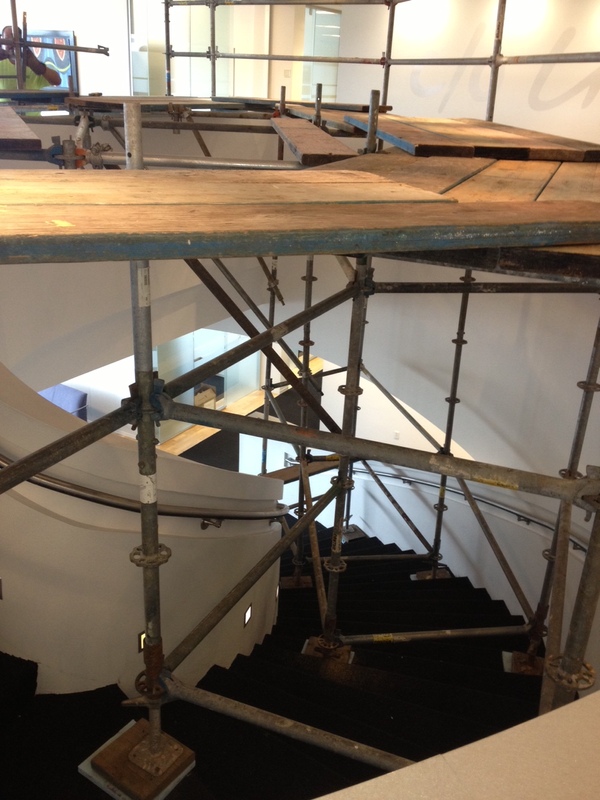 You can see from the photos just how they built the scaffold to fit into and around the staircase. 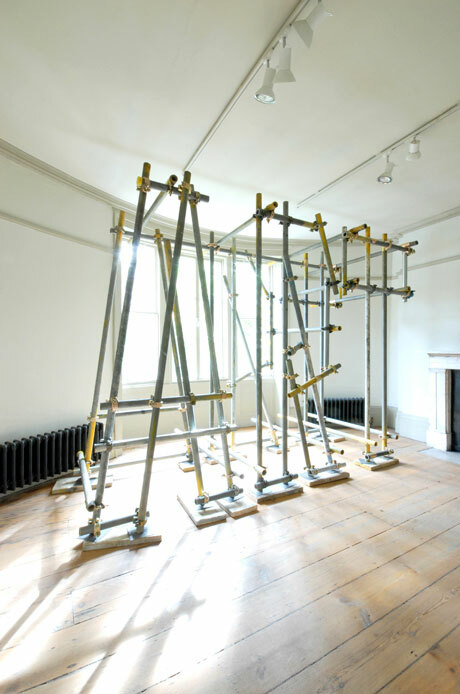 So remember, when you’ve got something you can’t reach with a traditional ladder or other means – scaffolding just might be the trick. 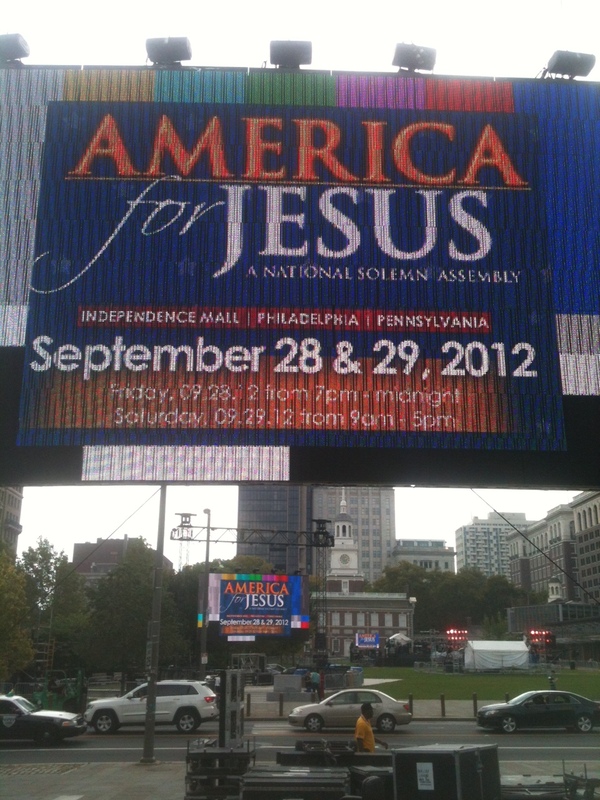 More info on the Cira Center at 2929 Market Street Philadelphia, PA 19104. Here’s a nifty little job. Something you might not see everyday: An Interior Canopy. 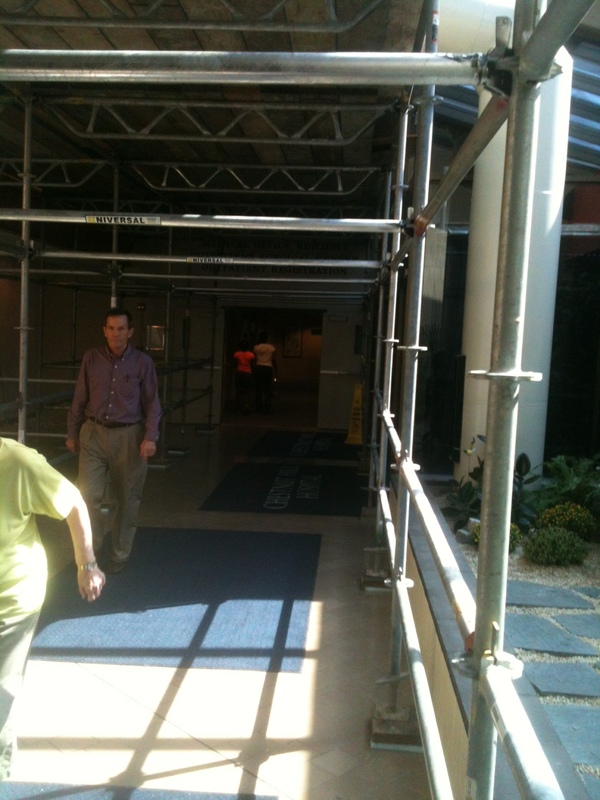 Now, you might be asking yourself, why would Superior Scaffold put something that is normally outside on the sidewalk, inside a hospital? 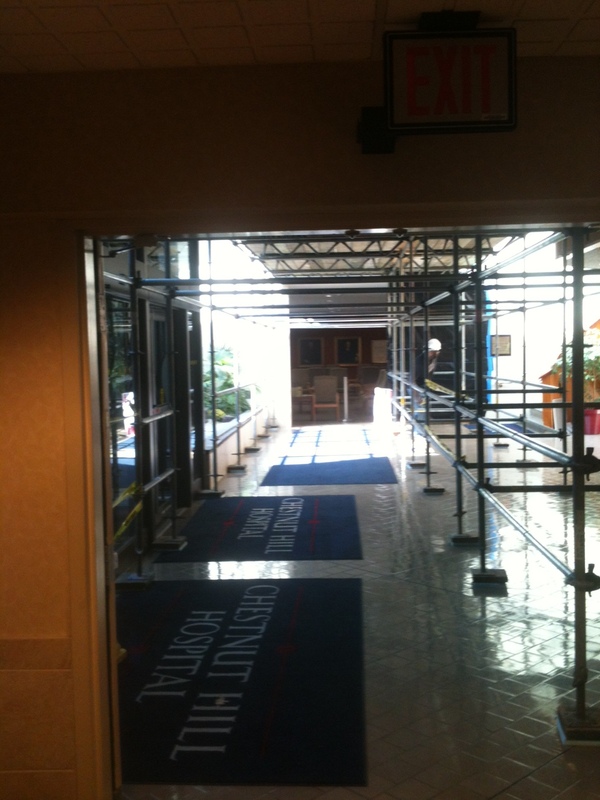 It’s simple, really – Chestnut Hill Hospital needed to remain open for business while repair crews replaced the skylights in the entire lobby and vestibule. 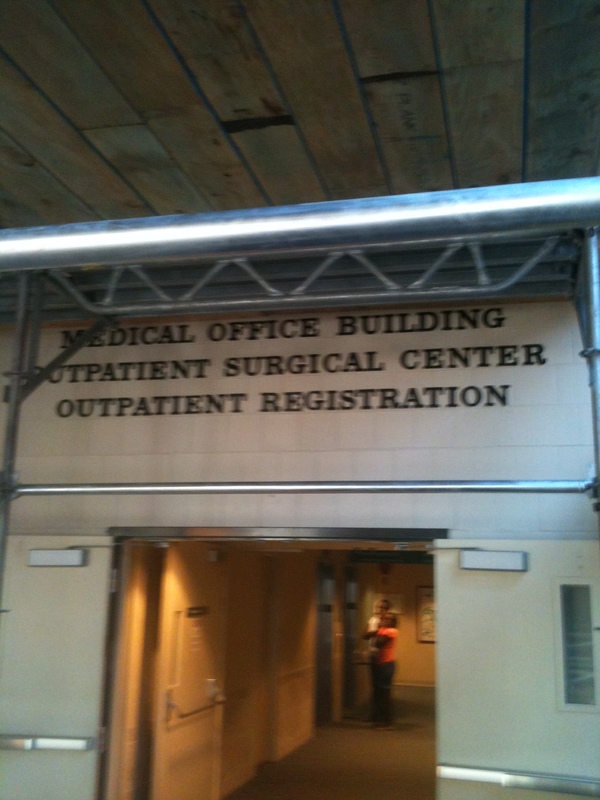 By putting what amounts to a canopy or sidewalk shed inside, doctors, patients, visitors and guests can all pass safely through the entrance while work continues overhead. It’s business as usual, as we say in the industry. 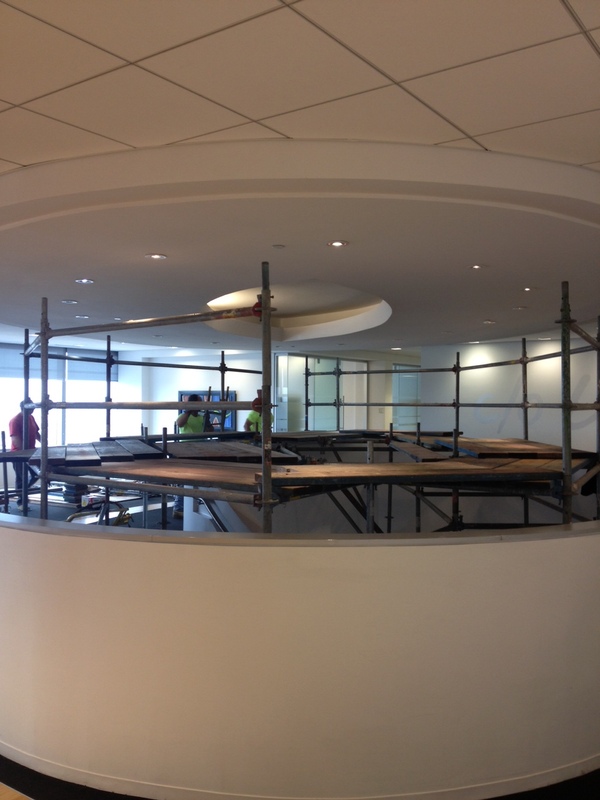 I’ll post some pics of the all glass ceiling when I get them. Chestnut Hill Hospital is a community-based teaching hospital with 164 beds offering a range of inpatient and outpatient, diagnostic and treatment services in Northwest Philadelphia. Superior is the best in the business when it comes to canopies / sidewalk sheds. Call (215) 743-2200 for information. 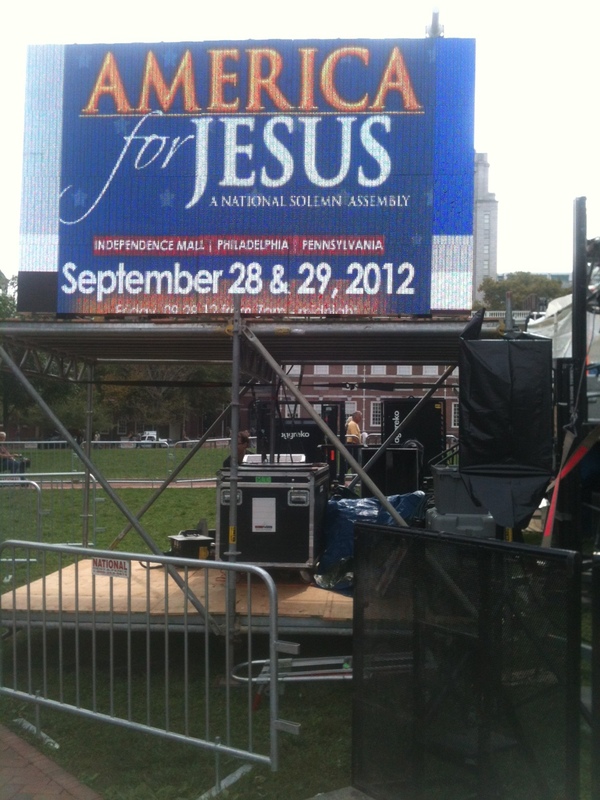 America for Jesus, (One Nation Under God, Inc.) called Superior Scaffold to provide the scaffolding for their giant assembly at the Independence Mall, Philadelphia, PA Friday 9.28 (7pm – midnight) and Saturday 9.29 (9am – 5pm). 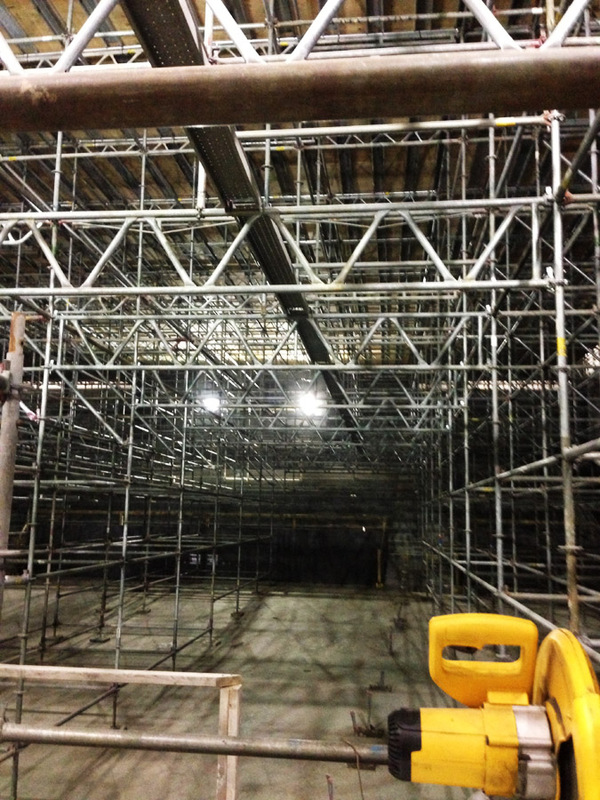 Superior was called in to provide much of the scaffolding support including 10 giant towers spread out all acrros the giant mall. 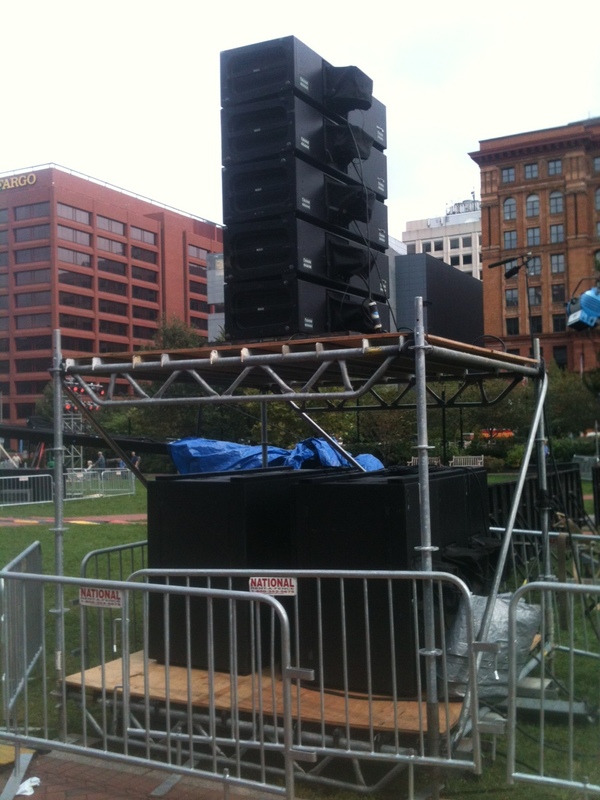 Eight of those towers are for speakers, lights and video units and 2 are for speakers and cameramen who will be videotaping the events. 2000 pound counter weights were added the bottom of the towers to help anchor and stabilize the structures. 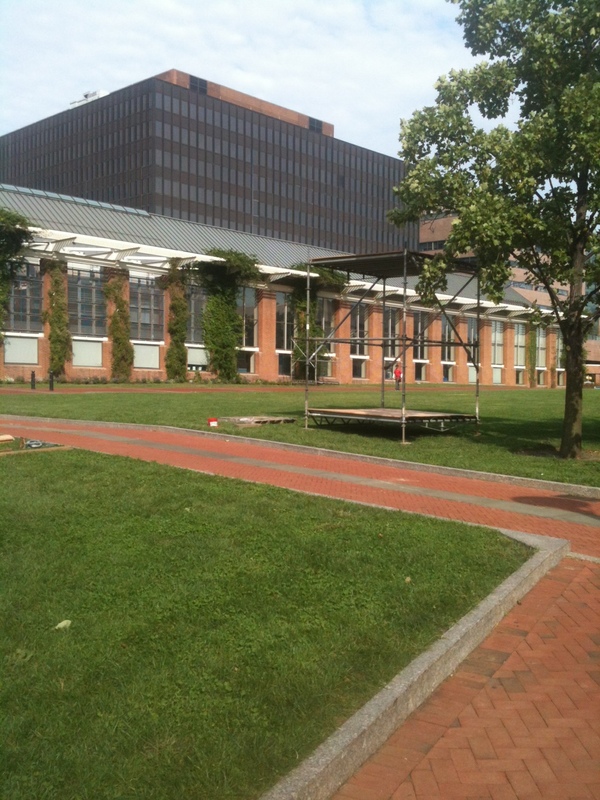 The mall sits adjacent to the Liberty Bell museum and directly in front of Independence Hall (where Superior provided the scaffold for the renovation). The organization is a coalition of ministries who unite to organize national calls to prayer for the sake of the church and the nation. It’s still not clear just how many people will attend this assembly but estimates have topped at over half a million people. 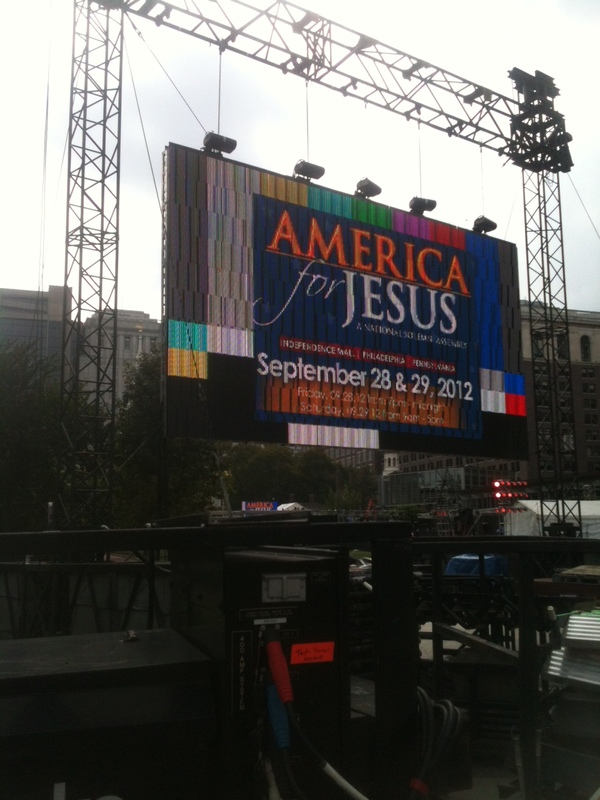 We will follow up with photos after the event. 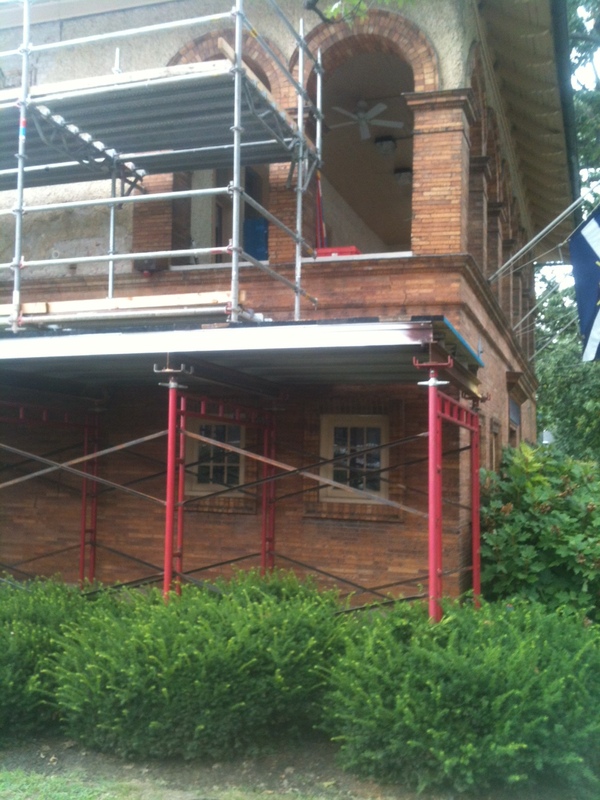 Pat McAndrew at (215) 743-2200 for all of your scaffold needs. 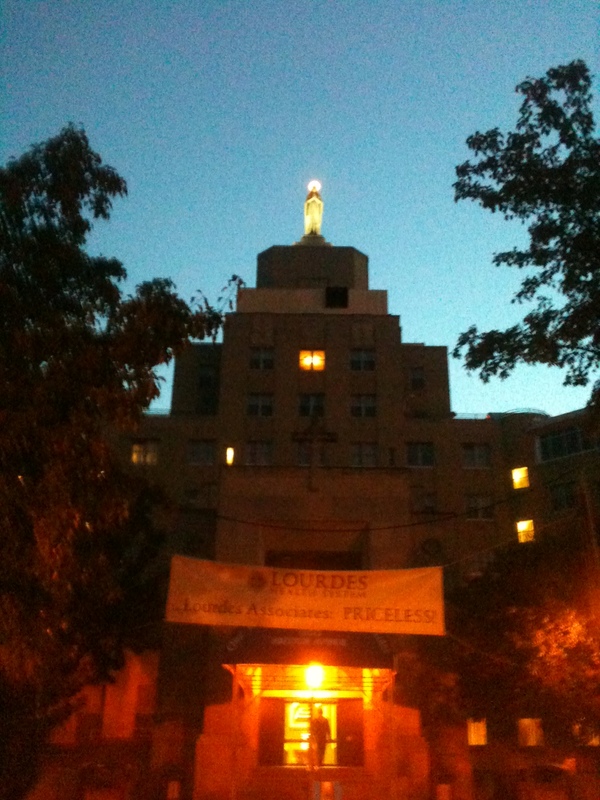 Superior Scaffold estimator Pat McAndrew was at Our Lady of Lourdes medical center early last week and snapped this gem of the Mother Mary statue in her full glory. Yes, it’s an iphone picture but you can clearly see that she’s up and beaming once again. I particularly like the halo at the top. 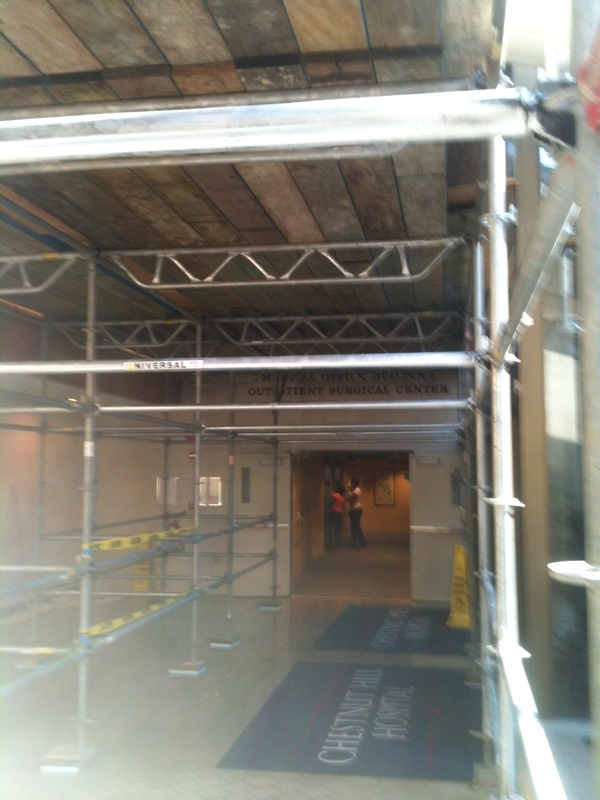 Pat was at the medical center for another scaffold install we are doing up “air” (as they say in Philly). I’ll get you details on that just as soon as them become available. And the follow up article in scaffold magazine – here. Amazing uses for scaffolding. Calpine energy turbine repair. 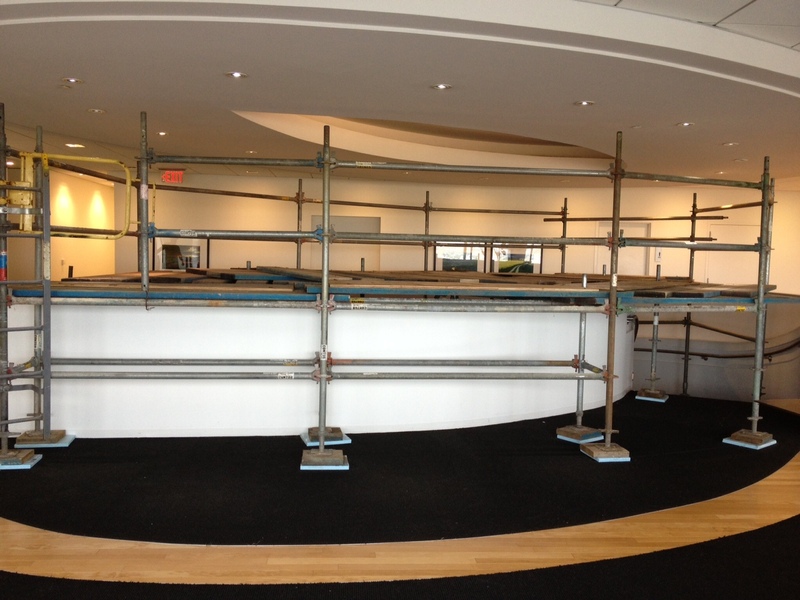 Every now and then, a really cool use for scaffolding comes across my desk, and this is one of those times. Maybe I’m just genuinely curious as to how stuff works but I thought I’d pass this along. This is the top of giant electric turbine at the Calpine Energy, Delta, PA power plant. The plant is a state-of-the-art, combined cycle, power generating plant powered mainly by natural gas. The plant consists of 8 electric generators – and these photos are of one of those turbines! Basically, these gigantic turbines spin around at amazing speed to produce electricity for cities and towns. Calpine called Superior Scaffold out to construct support scaffolding around one of the giant Siemens V84.2 turbines so the top could be removed and stored while work was done inside. 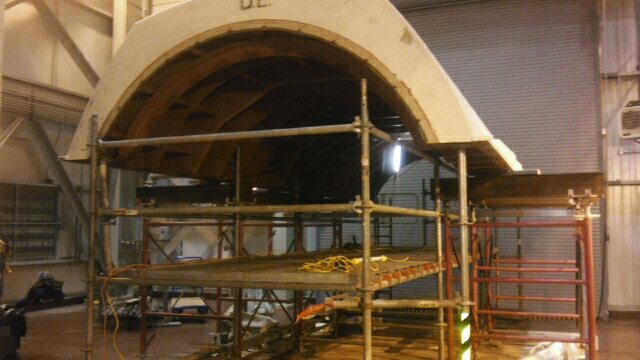 As you can see from the photos, just the top of the turbine is enormous. 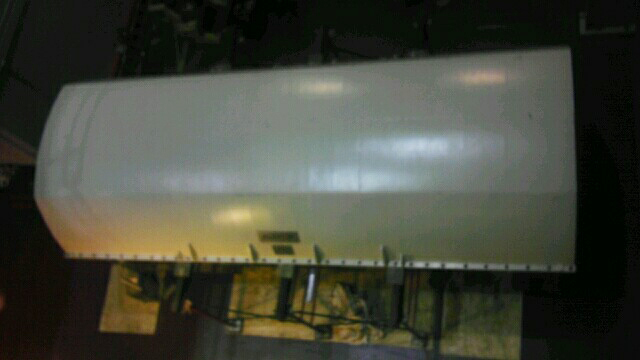 Once inside the turbine, crews had to pull the entire thing apart to find the problem. Once that was addressed workers had to reassemble the entire unit – but this time they welded counter weights on the turbine to keep it spinning up to a tolerance factor of 1000th of and inch. 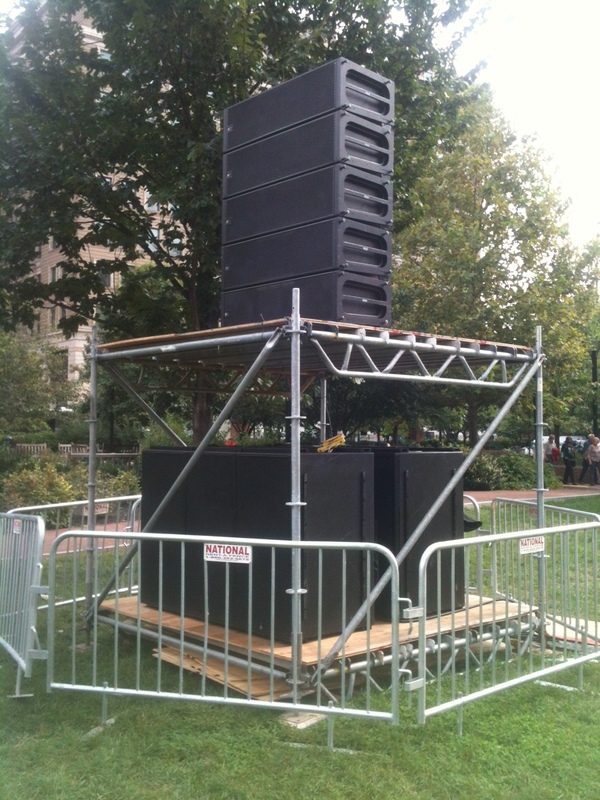 It always amazes me at the different uses for scaffold – and this is just another in a long list of cool applications. For a more technical description of how their plant converts energy read this blurb from their website. The plant works like this: Steam for the steam turbines is generated in heat recovery steam generators – unfired boilers that get their heat from hot gas exhaust leaving the gas turbines. The combustion turbines, which primarily burn natural gas, can also run on low-sulfur diesel fuel oil. When combined, these two power cycles (the gas turbine and the boiler/steam turbine) create a highly fuel-efficient plant, consuming significantly less fuel than needed by a traditional fossil-fired boiler/steam turbine generator plant. This conversion spins the turbines which in turn convert steam into electricity for Delta, PA customers. 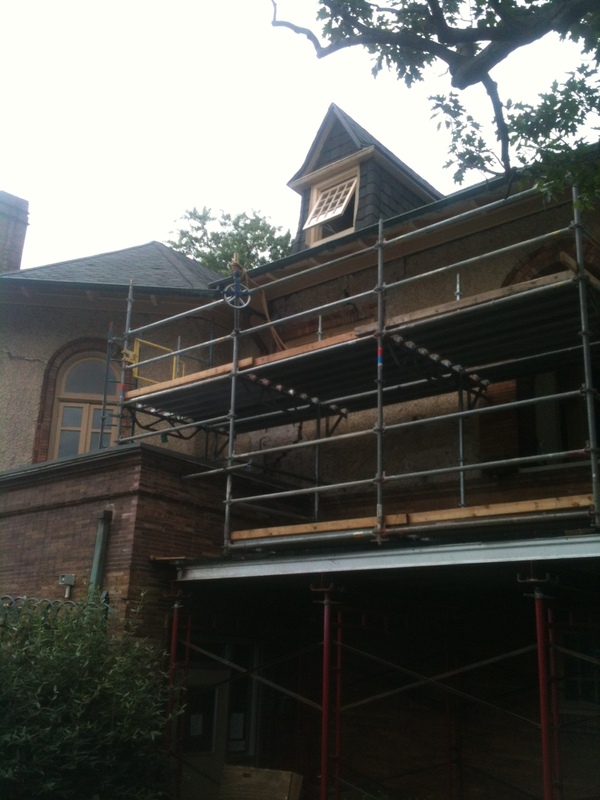 Superior Scaffold at Bachelors Barge Club (Est 1853), Philadelphia, PA.
Bachelors boathouse #6, (built in 1893) is repairing part of the exterior of their house on Philadelphia’s historic Boathouse row. Superior provided canopy protection for the side of the building while erecting system scaffold above – so crews could get access to the spots that needed repairing without hindering daily operations. 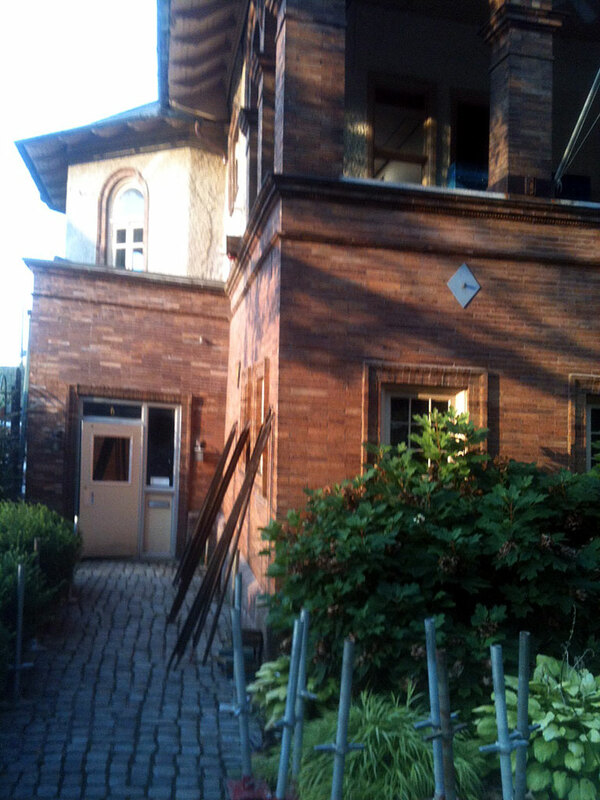 This is a unique opportunity to see a before and after view of the repair process. 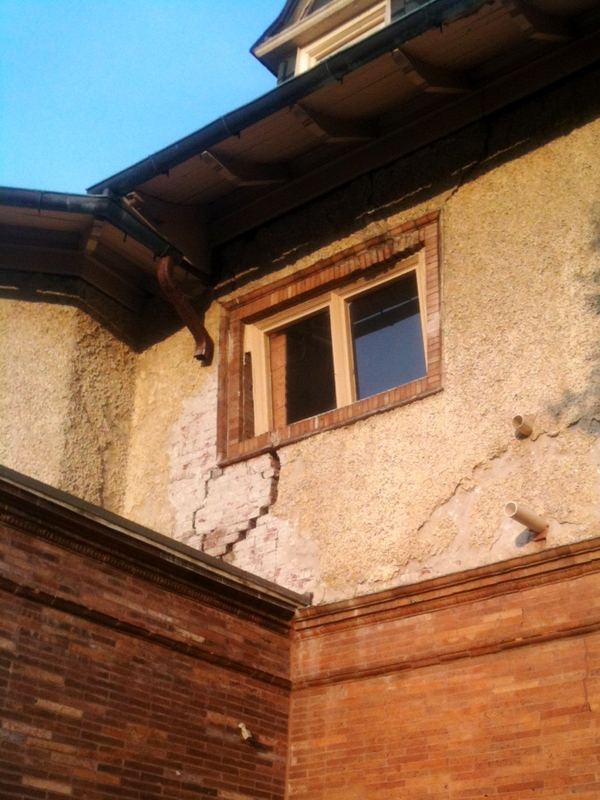 As you can see in the first series of photos taken by Superior estimator, Pat McAndrew, there are large cracks in the facade of the structure. 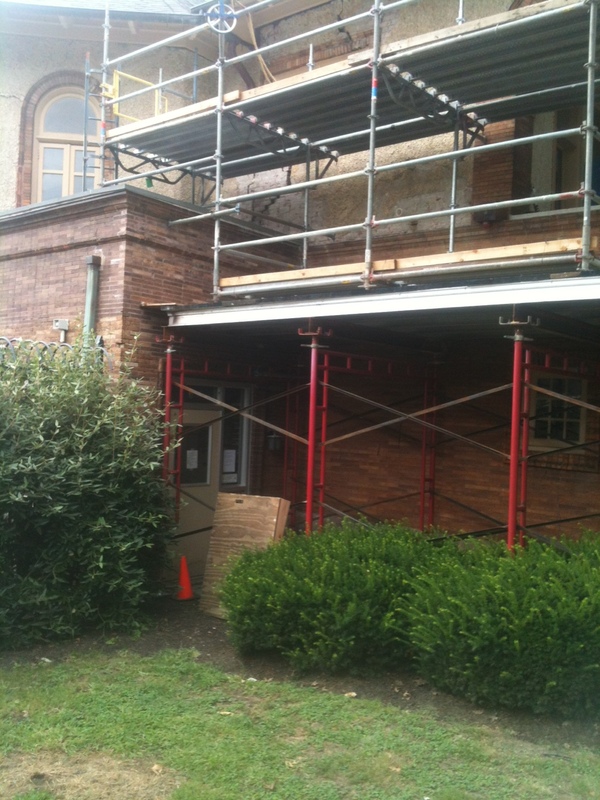 And you can see just where they are located on the building and where crews will have to get access to affect repairs. It’s Pat’s job to estimate the amount of man and materials it will take to finish the repairs. 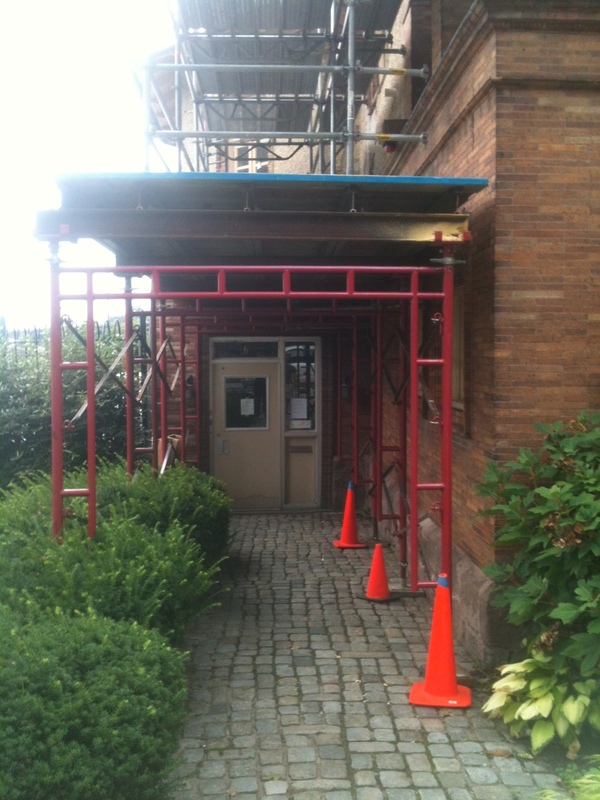 And in many instances, it’s also his job to configure the best scaffolding approach to access the job. Here, he chose 767 Philly frames to construct a canopy (sidewalk shed) over the entryway so Bachelors members could use the building on a daily basis while work continued overhead. This is a great way to keep business as usual for the buildings being worked on while creating a very stable platform for the work crews to complete their tasks above. Pat also chose a series of system scaffold on top of the canopy to create different levels, in essence, for better access. 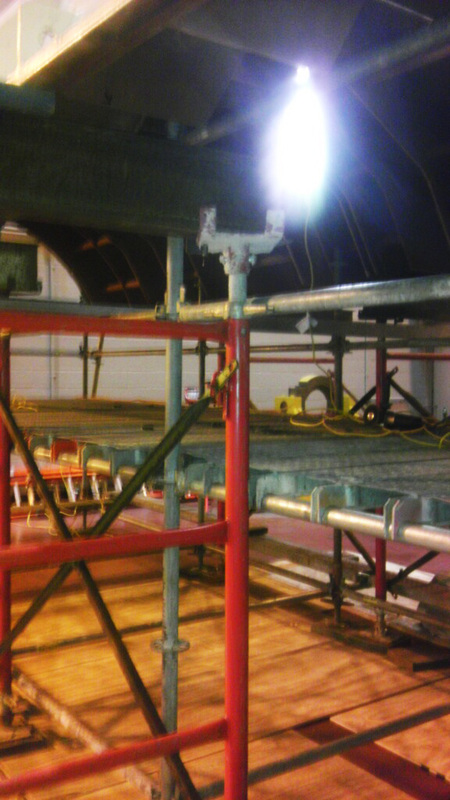 He also added a hoist and access ladders on the ends giving the scaffolding two separate levels. 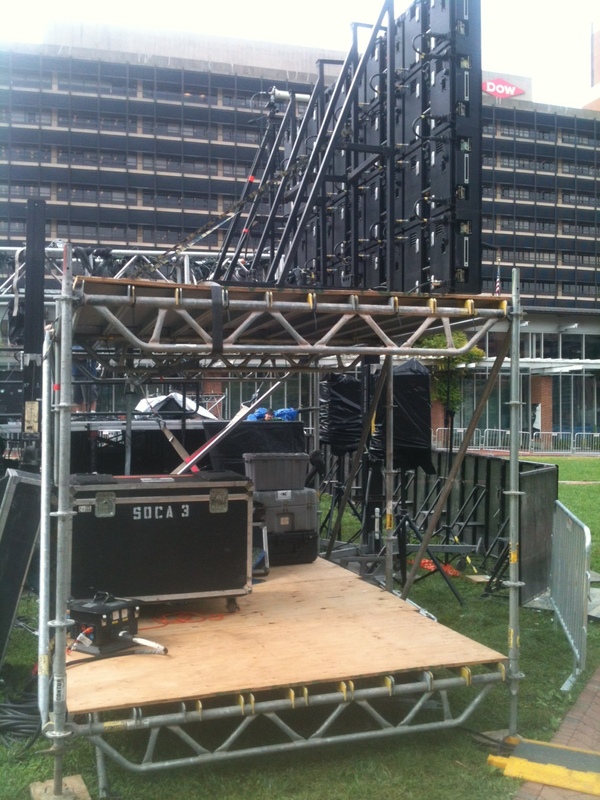 It’s all very stable and easy to get equipment up and down. 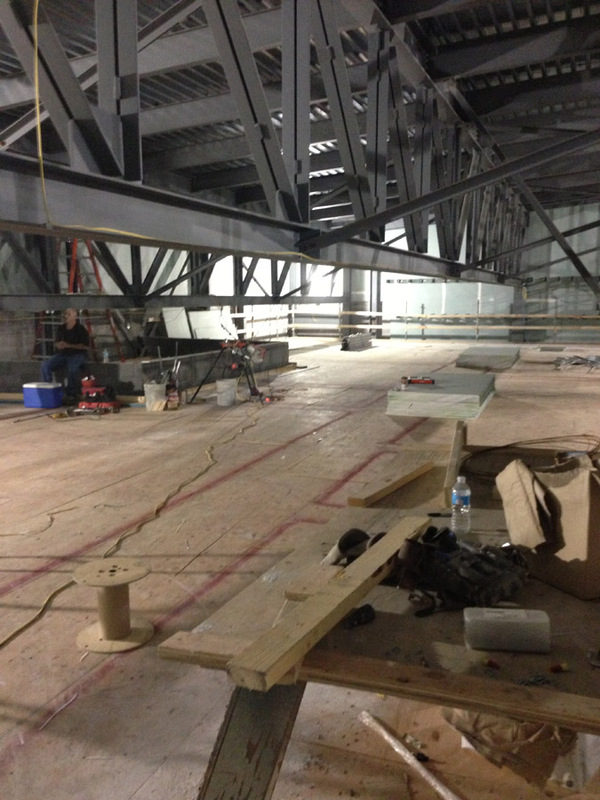 We will provide you with the finished photographs once the work is complete. If you need an estimate for anything scaffold related (scaffolding, scaffold services, shoring, facade work, inspection) just give Pat a call. He’s one of the best in the business. (215) 743-2200. 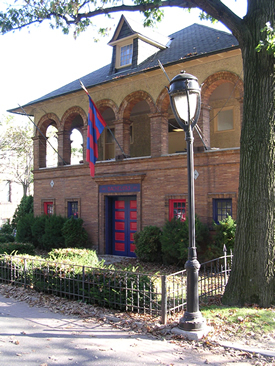 A brief history of Bachelors Barge Club. The club originally housed its boats in a wooded shack on the north side of the Schuylkill River constructed for the imposing sum of $67.85. 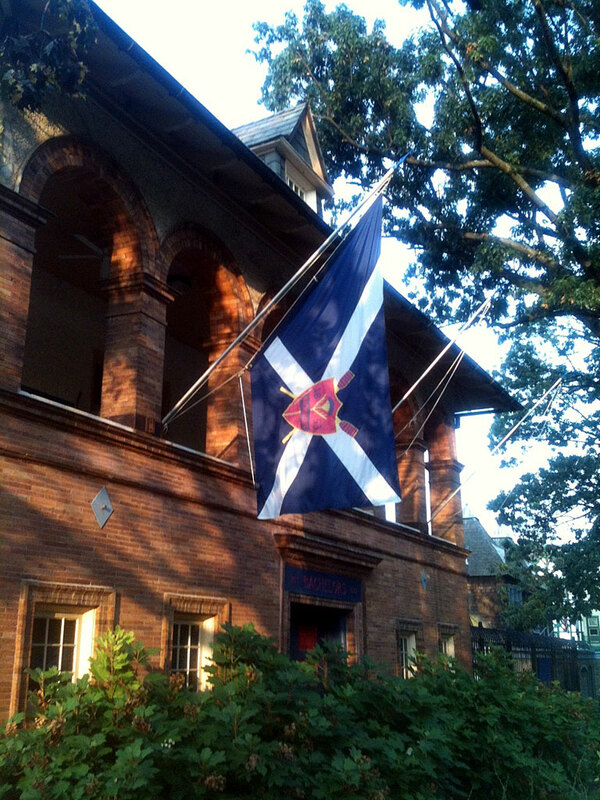 Today its over 150 members row out of a stately brick boathouse constructed in 1893 on the original site, now known as #6 Boathouse Row. 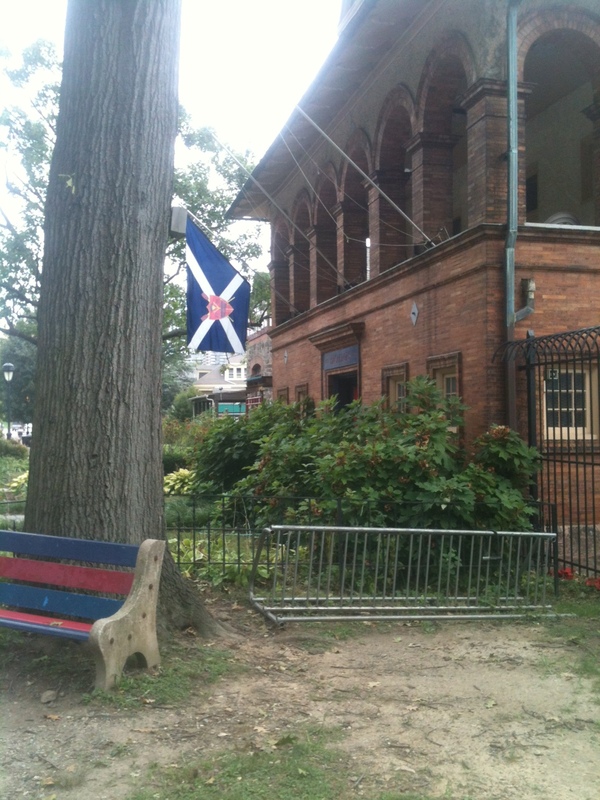 The boathouse is also home to four high school rowing programs and the Wharton Graduate Crew. 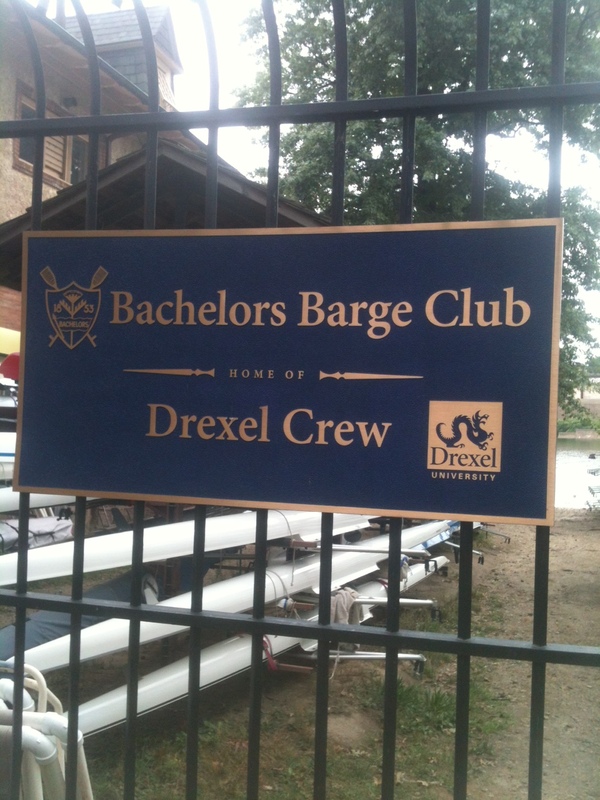 Bachelors Barge has hosted high school rowing on a continuous basis since 1948 when Lower Merion initiated a rowing program. Lower Merion was subsequently followed by Harriton High School, The Baldwin School, and Conestoga High School in that order. Wharton Graduate is the most recent tenant to join Bachelors Barge however they have historical ties to the club going back to 1864 when George W. Wharton was an active member. Boathouse Row is a historic site located in Philadelphia, Pennsylvania, on the east bank of the Schuylkill River, just north of the Fairmount Water Works and the Philadelphia Museum of Art. 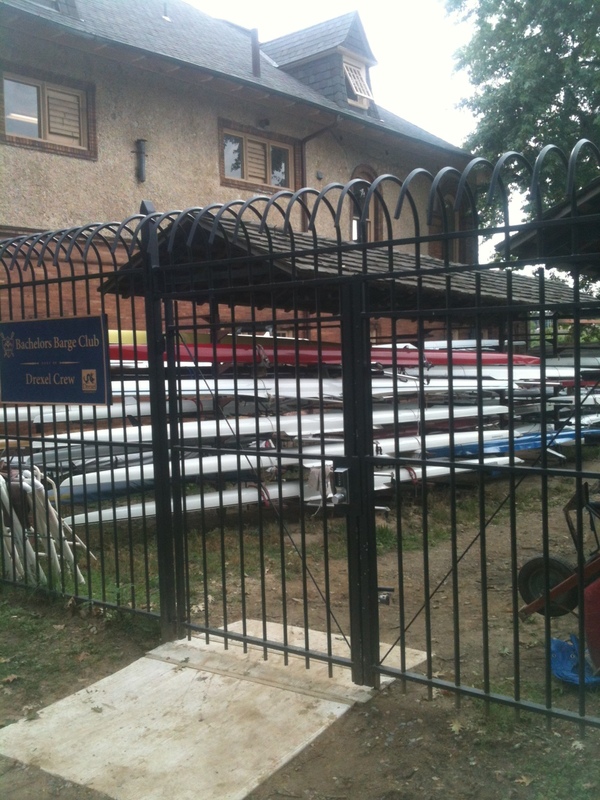 It consists of a row of 15 boathouses housing social and rowing clubs and their racing shells. 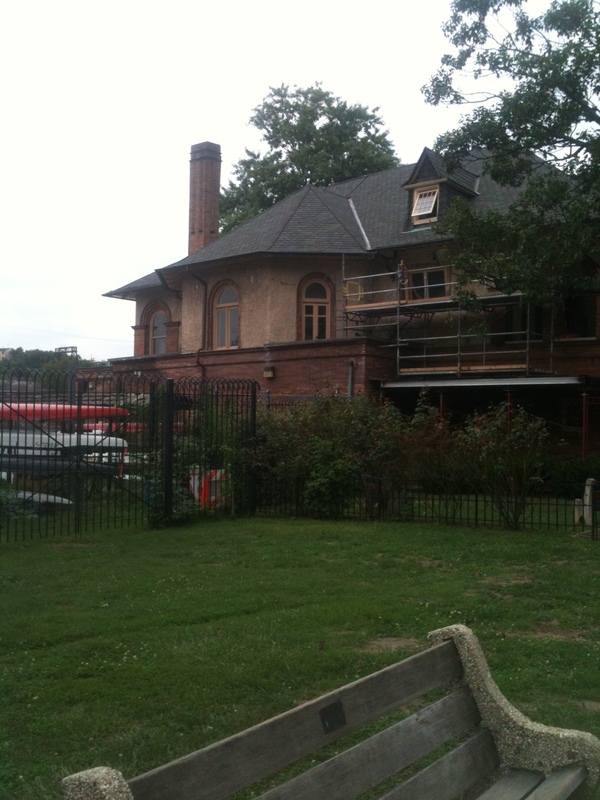 Each of the boathouses has its own history, and all have addresses on both Boathouse Row and Kelly Drive (named after famous Philadelphia oarsman John B. Kelly, Jr.). 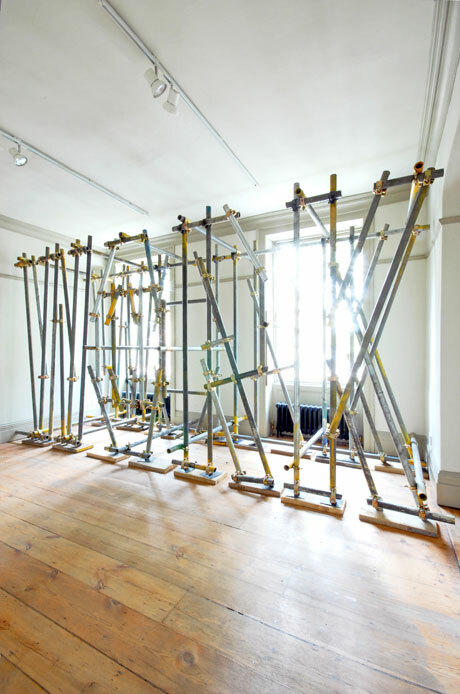 Artist Ben Long’s ‘Scaffolding Sculptures’ are series of three-dimensional constructions made from conventional scaffolding components. By using these builder’s materials out of their everyday context, Long creates meanings and symbols an audience would not normally expect. In this exhibit he creates the words Art and Work. The word ‘ART’ embodies the creative thought-process inherent in the conception of a piece as well as the practical skill required to physically make it. Likewise, the word ‘WORK’ describes not only the intellectual endeavor in pursuit of a final idea, but also the effort involved in an artwork’s construction. 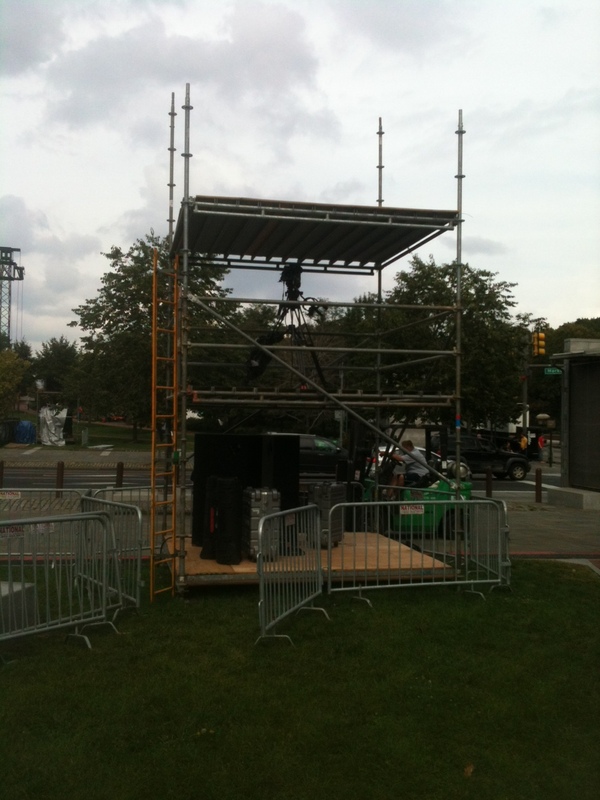 He does amazing things with scaffold materials that we, at Superior Scaffold, use everyday. Here are videos of him assembling his gallery pieces.